We’d love your help. Let us know what’s wrong with this preview of Against the Wind by Markus Baum. Eberhard Arnold was not afraid of the truth. A man for today's seekers, he faced life's essential questions head on. When he found answers, he lived them. His contemporaries dubbed him a "modern-day St. Francis." He renounced private property and the conventional church, choosing the early Christians as his role models. A man of unwavering conviction, Arnold walked resolut Eberhard Arnold was not afraid of the truth. A man for today's seekers, he faced life's essential questions head on. When he found answers, he lived them. His contemporaries dubbed him a "modern-day St. Francis." He renounced private property and the conventional church, choosing the early Christians as his role models. A man of unwavering conviction, Arnold walked resolutely against the prevailing winds, even as Nazism engulfed Germany. 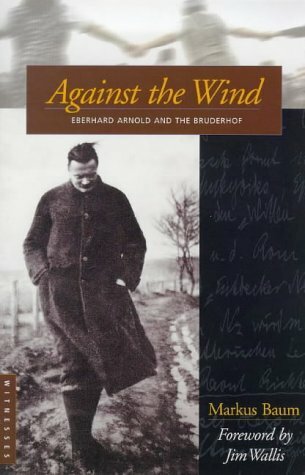 Against the Wind gives flesh, blood, and personality to a man whose contagious faith sparked a movement of practical Christian community. The Bruderhof, Arnold's legacy, carries on his commitment to integrate faith and action. To ask other readers questions about Against the Wind, please sign up. This is an excellent biography of my grandfather. Available free as a .pdf from www.plough.com. Biography at its finest. Markus Baum does a wonderful job telling the little-known story of Eberhard Arnold and the Bruderhof movement. I was gripped by his account from beginning to end.